Top Picture: The ICOA brings Challenger owners together. an endless river runway is what it's all about. Canadian Armed Forces, Maurice Baril is a Challenger enthusiast. I live near two major rivers, the Ottawa and the St. Lawrence. One of my favorite winter outings is to hook up with a few other Challenger owners and take off on a low and slow tour, travelling as far as we wish. The waterfront is home to fascinating real estate as well as many of the best inns and restaurants, which offer fine food, lodging and a warm fire in front of which to recall the day's adventures. More often than you would imagine, a whole day will pass with the highest altitude attained being 20 feet! The river is after all, an endless runway. Our ski tracks are frequently the first markings in the snow, like the first brush strokes on a giant canvas. I get a kick out of taxiing out and hitting the throttle as I turn into wind. With the airplane airborne at 25 mph, my takeoff tracks are extremely short, usually less than 50 feet. I'm probably the only one who notices, but I'd love to know the thoughts of passing GA pilots who must surely be baffled as to how the tracks so suddenly end. With the Challenger fleet having passed 3500 around the world and a Canadian population of more than 500, we are fortunate to have the resource of an active and helpful, owner-driven International Challenger Owners Association. The ICOA publishes a quarterly newsletter and it brings together owners from everywhere to share their enthusiasm. For owners in Canada or the U.S. there are always plenty of other Challengers nearby to hook up with. 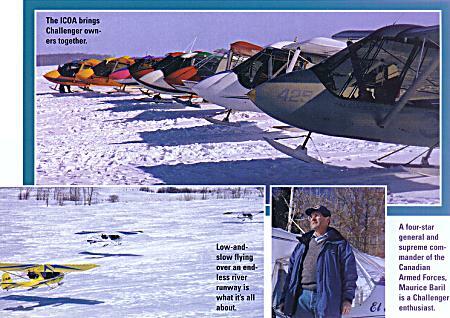 Our Canadian chapter of the ICOA hosts a major annual winter ski fly-in. It alternates annually between two luxury hotels near Montreal and Ottawa where the frozen waterfront serves perfectly as an airport. In 1992, the event happened to fall on the coldest weekend in many years. Daytime temperatures never rose above 30 below zero and the overnight low exceeded 40 below. It was seriously cold! With more than 70 percent of Canadian Challenger owners coming from a GA background, most arrived by car, as they were not used to aircraft engines being user-friendly in such temperatures. Seven of us arrived in our Challengers and we all felt pretty smug when it came time to leave. Our Rotax engines started without preheating or protest, while not a single car would oblige!